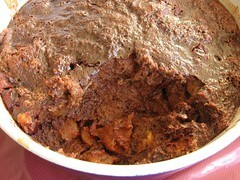 Chocolate and Brandied Dried Cherry Bread Pudding - Do You Know The Muffin Man? Notes: In addition to cherries, I used dried apricots, peaches, pears and cranberries too, soaking them overnight in the brandy. For the bread, I used some plain pandoro and reduced the sugar to about one-third cup. I didn't mix in the unabsorbed alcohol, and just spooned out the macerated fruit. The whole thing was baked for about 70 minutes in a larger baking dish instead of individual ramekins. The pudding is divine: nice chocolate flavour, good balance with the dried fruit, and warmth from the brandy (the fruit soaked up two-thirds of it).